I tried this combination over the weekend: hot chocolate and chocolate flavored caffeinated marshmallows. The marshmallows had a couple of spots with a candy like flavor that they lack when eaten without hot chocolate, but otherwise the combination worked very well. 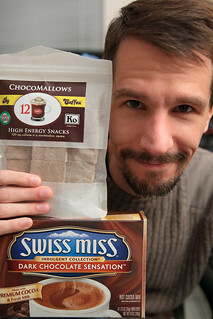 I suppose marshmallows without a chocolate flavor would work, too, but these caffeinated ones don’t come it that flavor. A while ago, I got I2C repeated starts and SMBus support to work from the Linux kernel on a Raspberry Pi. I recently built a new 3.10.25 kernel from the foundation’s kernel fork on Github and updated my own fork of their fork with just the I2C update in a new branch. In the process, I managed to misuse git so that commits now attempt to go to the Raspberry Pi Foundation’s kernel fork rather than my own. I tested the module on the copy of Raspbian that I have. It is running the 3.10.24 kernel, but is quite happy with the new kernel module (or for 3.10.37, or 3.12.24) and my MLX90614 test program. I also built the kernel module for the BMP085, but it looks like that requires more than just a kernel module file to get it working. No big deal for me; I’ll just replace the whole kernel. I just wanted to see if I could make it really easy for someone else. To use the updated I2C module, first download it. The file will need to replace the one in /lib/modules/<kernel version>/kernel/drivers/i2c/busses. You may want to keep a copy of what is already there. After copying it, check to see if the i2c-bcm2708 module is loaded. If not, load it up and have fun! If it is, you can either reboot or unload the i2c-bcm2708 kernel module. Before unloading will work, any dependent modules must first be unloaded. It wasn’t loaded for me right after boot, so it hopefully won’t be any trouble. Update: I finally got the code up on Github. I hope the kernel module has been working out for anyone who has tried it. Please do leave a comment about any success or failures with it. I have yet to get any feedback, so I only have my own test case to claim that it works. Oops: I made a common mistake when I wrote this post. The output of a flash is controlled as a fraction of maximum output energy, not power. Changing flash power can only change brightness reliably for photographic use if the duration of the output is constant, and that assumes constant power during the output. A camera sees more light as brighter, so flash energy is useful to control, while flash power is not. Power is energy over time. I haven’t bothered to correct the rest of the post. It is good to have diffuse light for soft shadows. To that end, when I can’t aim the flash at a ceiling I use LumiQuest softtboxes because they aren’t super pricey (although there are cheap competitors from beyond the USA now), and they are very portable. This isn’t an advertisement for the product, though; I’m not getting paid. Instead, this is about an investigation I did into how to get the best results from the LumiQuest’s Softbox and Softbox LTp. 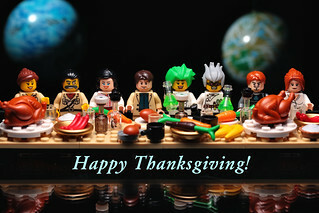 I got the LTp to help with some Thanksgiving dinner pictures of Lego minifigures. It is almost too large for something attached to a flash, and it did take a few tries to keep it from falling off. It was facing downward to be an overhead light, but that made falling extra easy. I wanted the light to be as even as possible, so I used the pull-out light scattering lens of the flash. This put the flash’s zoom head into its 14mm setting, which is really just the 24mm setting with the lens applied. The lens is made of some plastic like material and absorbs some light, which was also helpful because otherwise the flash was too bright. The flash in question here is the Yongnuo YN568EX II, which is working out quite well for me, but that could be the topic of another post. Afterwards, I wanted to investigate what works best with the LTp to make the softest shadows. It makes sense that the light will need to be uniformly bright across the light scattering surface of the softbox for the best results. I took pictures of the LTp with different flash zoom and power settings to get an idea of the uniformity. The exposure was the same for all pictures (f/16, 1/125sec, ISO 100). The resulting test is not indicative of overall brightness because most of the images have over-exposed areas. They do, however, clearly show that the 14mm flash zoom setting does provide the most uniform light over the surface provided by the LTp softbox. The 24mm setting isn’t much worse, but the 105mm setting looks like it should make the LTp perform the same as a much smaller softbox. Next, I decided to see what effect this has on the quality of shadows. I put a cardboard tube on frosted glass so that I could photograph the shadow on the glass, and because I had the glass already setup. I later discovered that the shadow on the glass was sometimes filled in with light from the flash reflecting from other surfaces in the room which obscured what the shadow would have been with light only directly from the softbox. The test images also had a shadow cast by the tube onto itself, which turned out to be mostly immune to the problem. It made for small test images, but I think they worked out well. For a more complete test, I also tried my old LumiQuest Softbox (the one with a notch in what otherwise would be a rectangular light scattering surface), a bare flash, and a misused Sto-Fen Omni-Bounce. I varied the flash power, but not the exposure (f/4, 1/160sec, ISO 100) or distance between the flash and tube (about 740mm, or 29 inches). In all cases, the 14mm setting required quadrupling the flash power and the modifiers required doubling it. The bare flash at 24mm used 1/32 flash power. The 105mm flash zoom setting required changing flash power, but it wasn’t so consistent. 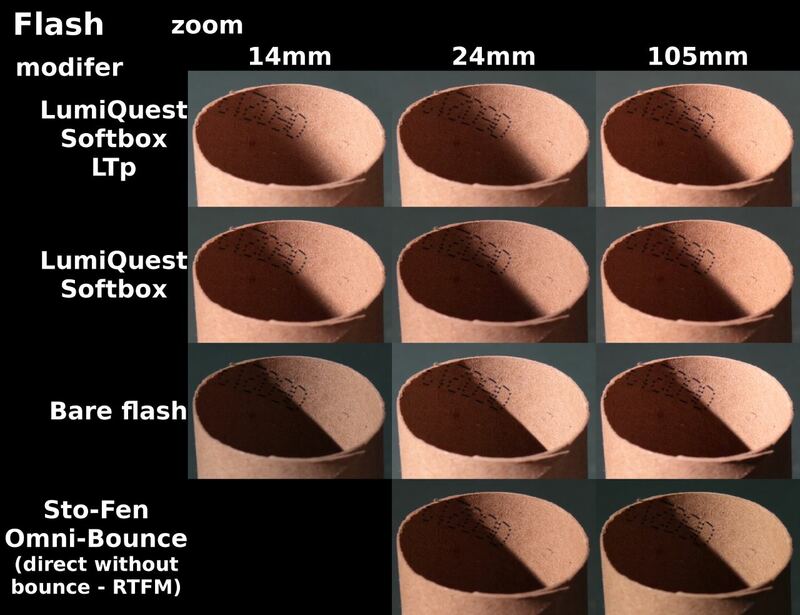 The results show that the LTp softbox responds more to the flash zoom setting than the other LumiQuest softbox I have. The LTp improves with the 14mm setting over the 24mm, but the loss of light from the flash’s scattering lens will sometimes make 14mm too dim. Other flashes may fare better, but I think most will be similar if they don’t use a glass scattering lens. Using the LTp with the 105mm setting makes it about as good as the non-LTp softbox at 14mm or 24mm. 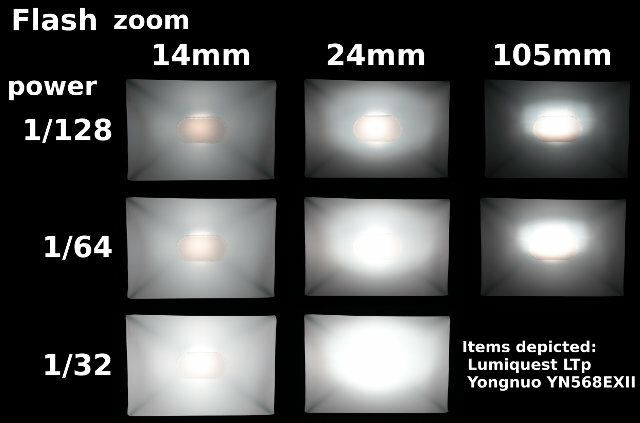 The LumiQuest Softbox (non-LTp) produces shadows with a negligible difference with the 14mm and 24mm zoom settings, but does get worse at 105mm. The bare flash gives the expected shadows with hard edges, but it does seem to be very slightly softer at 105mm. This suggests the zooming action changes the uniformity of the brightness across the flash head. Finally, I tried a Sto-Fen Omni-Bounce pointed directly at the tube. The Omni-Bounce is a light scattering device that doesn’t add much surface area like a softbox does. This makes it half of a light diffuser. The other half is supposed to be the ceiling and walls of the surrounding room. The little card included with the Omni-Bounce states that it should be pointed at the ceiling and not the subject. This test shows why. I have seen some people misuse their Omni-Bounce by pointing it directly at their subject while inside a convention center with high black ceilings, but that just results in wasting flash power.